This week's recipe from Around My French Table (AMFT) is Orange Caramel Scallops. I like scallops a lot, and it orange caramel made them perfect. Over the past few years, I've been trying to learn more about meats and seafood. After watching Gordon Ramsey scream "these scallops are RAW" on Hell's Kitchen, I wanted the finished scallops to have nice tender creamy center or perfect crispy outside. I wanted the real thing already thawed (I have to pretend they're fresh), so Gary set off on a mission to find the scallops. He returned from Madison with the butcher-wrapped present from the Seafood Center. The recipe is very well written with the perfect amount of detail. I followed the steps exactly. 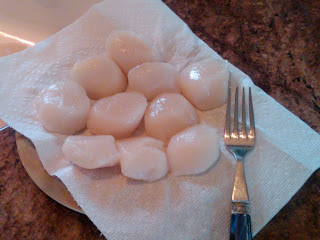 I carefully dried each fresh scallop, and heated the pan as I had been taught in a cooking class long ago. The pan had to be hot enough for me to hold my palm about an inch away from and pan and not be able to count one-one thousand, two-one thousand before the I had to pull my hand away. While the pan heated I made the orange caramel. I've made tons of caramel, and this recipe pretty tough. The recipe makes dry caramel, aka no water with the sugar in the pan. 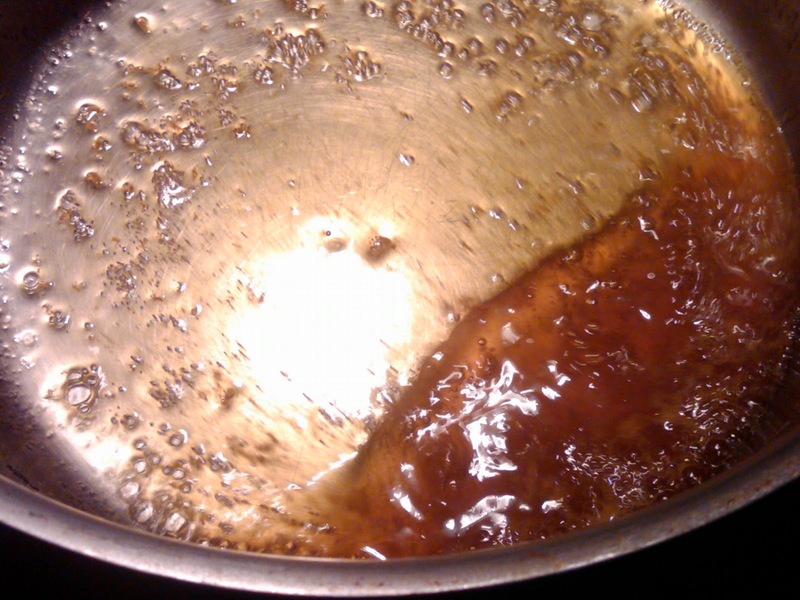 The sugar becomes amber colored very quickly. The recipe has you add white wine and the juice of an orange to the caramel. If I were teaching a class, I'd have the class gently warm the juice and the wine. This will keep the caramel from turning into a hard crack, glass-like lump when the cold liquids hit. I followed the directions and added the liquids. The caramel did turn into a hard mass, but quickly liquified and reduced to a perfect orange caramel topping. The small quantity of sugar in the recipe didn't cover the bottom is the pan, so there was little risk of the sugar bubbling up and burning my hands/face with splattered caramel. Remember that hot sugar is like hot tar. Always be very, very careful. Enough lecturing! Ok, now on to the scallops. 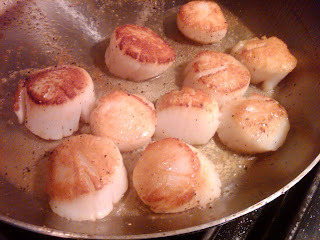 I added the olive oil and then the scallops. With as much will power as I could muster, I waited the two minutes per side with flipping them. They were perfect! Again, I could hear Gordon summoning me to the Hells' Kitchen pass and then saying, "these scallops are perfect". One side down, One to go! 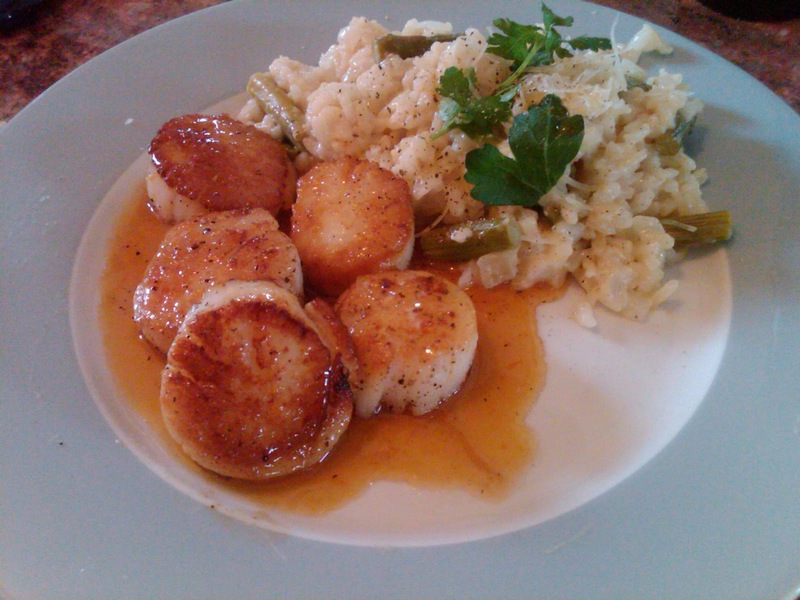 I plated the scallops, added the sauce, and completed the meal with Risotto with asparagus. It was SO good. I don't know what's on the April schedule, as always, I'm sure it will be great. Last week, I also made the Cauliflower Gratin from AMFT. Even non-vegetables will enjoy it.